Spring has officially arrived and either you’ve decided to skip spring cleaning this year, or you’re like me and spent all of January binge watching “The Life-Changing Magic of Tidying Up” on Netflix, fell in love with the Marie Kondo method and proceeded to purge all of your closets and drawers to get rid of everything that doesn’t “spark joy” in your life. Maybe you’ve had a yard sale or made what feels like a hundred trips to your local donation center, or like me, you’ve done a little bit of both. In the process of tidying up, you’ve likely come across a lot of things that might not exactly “spark joy”, but you know they are items you should keep somewhere in an organized fashion. For me, these items include important legal and financial documents, insurance policies, and supporting documentation for tax returns. Digitizing paperwork can allow you to physically declutter your file cabinets, or let’s be honest, that kitchen junk drawer. It provides you the opportunity to retain pertinent information, but in a format that is easier to organize than having to manage physical storage space. In general, it is also a good practice to keep a digital back up of your various important documents. The question then becomes, where can I safely store my digital documents, where I know I will have the access I need and when I need it? As part of our planning software, Bridgeworth clients have access to a digital storage Vault, which is essentially an online safety deposit box with 24/7 access, available anywhere in the world you have Internet access. You can rest assured that it is a secure location with no data caps, meaning you can store as much or as little as you want. The Vault can be customized to your liking to help you sort and organize your documents, and even your photos, in a meaningful fashion. For me, this looks like creating folders of broad categories such as insurance, estate planning and taxes. Within these folders, I have created subfolders to further drill down and organize for things such as, insurance type or tax year. 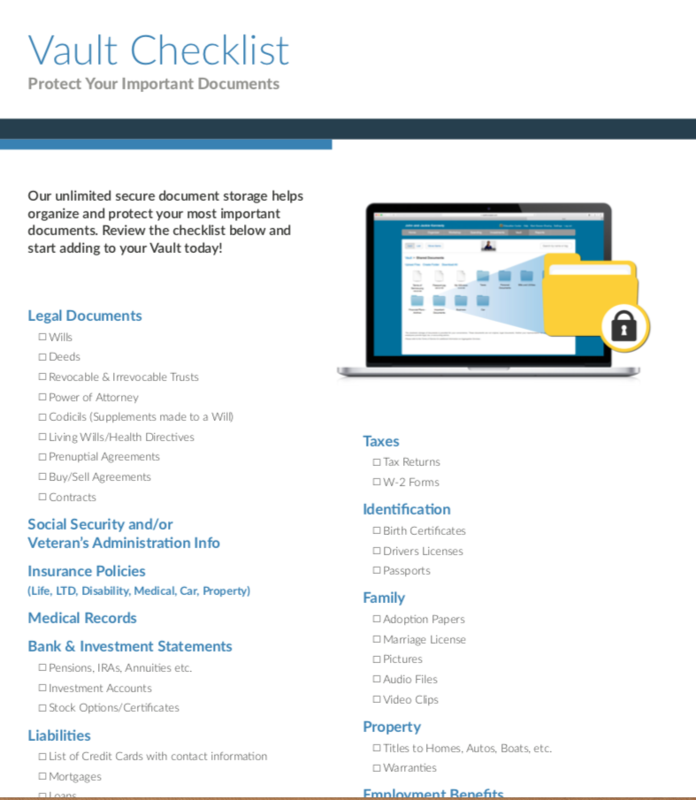 The Vault also has a feature that allows you to choose if you want to share a document with your financial advisor. So the next time we ask you for a copy of your most recent tax return, with a few clicks, you can easily share documents with your advisor within the Vault, without ever having to touch your email or find a fax machine. While digitizing documents can allow you to visually reduce clutter and get organized, there will always be a need to keep the originals of various documents. These likely include your birth certificate, social security cards, estate planning documents, property deeds, etc. For those documents that you must retain a physical copy of, you should keep them in a place that can be securely locked. To further protect from devastation such as fires, floods, tornados and other natural disasters, you should consider storing your documents in a fireproof and waterproof container. So now you’ve cleaned out your files, you’ve digitized and uploaded everything to the Vault in an organized fashion, and you have stored your originals in a secure location. Congratulations, this is no small feat! Except now, you’re staring at a pile of papers you are ready to toss and wondering what you should do with it. In the process of tidying up, we don’t want to “spark joy” for a dumpster diving thief! So when you are ready to discard those documents, make sure that you dispose of them in a secure manner. Shredding is an easy way to carefully dispose of unwanted papers and lucky for Bridgeworth clients, we host an annual Shred-A-Thon event in April for our clients to come have their documents shredded in bulk. Ultimately, taking the time to sort, simplify and organize those legal and financial papers in your life, will not only give you a sense of control and peace of mind, it also frees you to focus on the things that truly spark joy in your life, and for me that looks like reading more books and finally planning that trip to Europe I’ve been dreaming about.